Cards on the table, I’ve been almost done with this table for about two weeks, just needing to prepare the tabletop and do a quick smoothing before glue-up. The tabletop should only require two boards, so it will go quickly once I get some time to go back to the project. It’s been blocking traffic for a while. In the meantime, though, I learned an important lesson during this project. 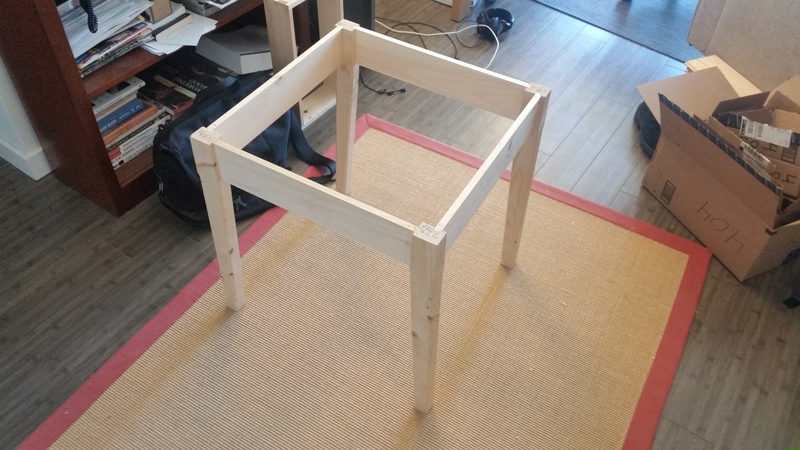 I had shaped the angled legs over a year ago, removing rough stock by hand and then cleaning up the profile by trim router with a plywood pattern and a pattern bit. Although they are pretty close, none of the legs is identical to any other (except for height, which is remarkably close for being cut on a chop saw). Each leg varies slightly in rake and, after some straightening, thickness. Sending them back through the thickness planer would mean also redoing the stopped chamfers, so I figured there must be a way to keep the table square and straight without making the legs identical. Turns out, the basic principals of marking were the solution. I had always planned for the top to overhang the frame a bit, so as long as the frame was square, I could hide any variations due to the legs. In theory, as long as I marked from the same edges on each leg, and the parallel rails were identical in length to the shoulders, any variation on width or depth would be purely cosmetic. So I took great care to size the rails perfectly. Then I assembled the frame and, while the frame overall was square, one of the rails didn’t seat squarely. This confused me, because I had marked everything from the same reference edges on each leg. However, the front and back rails were marked from the outside, not the inside like the side rails. Because of the varying thickness of the legs, this added extra length between the mortises for the front and back rails on one side. I ended up having to take down the inside thickness of one leg by hand to fix it. The moral of the story is: there is more to consistent marking than using the same reference face. When parts are not identical, there is also a correct reference face. To be safe, while marking mortise layout, if you can, reference your marking gauge only on the faces where the mortises will be.